End-of-year greetings to you, my fellow travellers. For even if you went nowhere this year, we all went somewhere: around the sun in 365 days. How was your trip? an island in the sun (in Tuvalu)? Most nights, before I close my eyes to sleep, I think of the highlights of the day, to ground myself in my own experience of it and remember all I have to be thankful for. Now I seem to have got into the habit of doing this at the end of the year too. 2015 was a year of trying to live as simply as possible - without living out of a duffel bag - which is a bit of an ongoing mission for me. Of course life loves to mess with our plans, teaching us lessons along the way, but most days the simple things are my highlights, particularly: spending time in the sea and with people I care about, and doing work I love. 1. Living in one place. This was a bit of a novelty for me, particularly after my year and a half as a digital gypsy. It was also new to live in regional Australia. I'll always love Sydney, but I love my new hometown, Lennox Head, too, because living in a small town does simplify life to some extent. The pace of life is different, it seems as if there's more time and space, and fewer distractions. Here are 10 more reasons I love the Northern Rivers. 3. Learning to build a cabin. 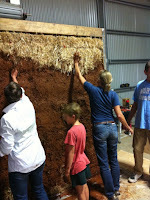 In June, I did a 4-day natural building course, in a big shed at The Farm, in Byron Bay. In my travel-starved state, it felt like taking a short trip - to a place I'd never been before, but had long been curious about - and it was fun to learn about something completely new to me. 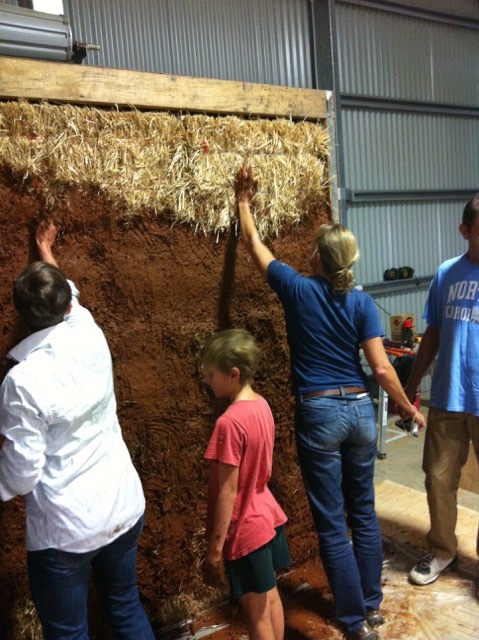 I learned the basics of strawbale building and inched a little closer to my dream of one day building my own cabin (or tiny house). 4. Turning Japanese. In the spirit of keeping things simple, and local, I wrote a bit about northern NSW this year - about Byron Bay, about hotels like Rae's at Wategoes, about beekeeping and, most memorably, about Japanese culture in the Northern Rivers, which reconnected me to a headspace I was in when I lived in Japan 20 years ago and had a year and a half of surfing and teaching English. 5. Uluru sunrises. There's nothing like the centre of Australia to strip life back to its essential elements; light, space, existence. And there's nothing like an outback sunrise to make you feel connected to the earth and cosmos all at once; they're always worth getting up in the dark (and cold!) for. It was also great to see my travel mates again at the Australian Society of Travel Writers conference and to touch the Rock with my bare hands (one of my top 10 ways to "do" Uluru). 6. Swimming in the Maldives. Finally, some international travel! Having not been overseas for a year (Dear world, I miss you - 13 reasons to love travelling), going to the Maldives on assignment was a real treat. I've long wanted to go there, and it's even more beautiful than it looks in the pictures, the water even more turquoise, and you get to swim with turtles and manta rays without even trying. Here are 8 more watery reasons to go to the Maldives. 7. Beach-walking for Change. On Sunday 29 November, I walked barefoot with 300 others along Lennox's Seven Mile Beach for action on climate change, our local People's Climate March, the day before the start of the Paris climate talks on 30 December. I loved helping to organise it and felt so proud to be part of this community that cares about the natural environment we all depend on, wherever we live in the world. Of course every year has troughs and valleys in between its peaks, but that's the way life is, and for all its craziness, to paraphrase Desiderata, it is still a beautiful world. Thanks for following my travels this year and I hope 2016 brings you all peace, love and new adventures of all kinds. Happy New Year to you! Great post - and I agree that sometimes staying close to home has its own rewards. But I do envy you going to Tuvalu. That's a place you don't hear about often - and I'll look forward to reading your posts about the simple life there! Thanks Lee, loved your end-of-year post too, a good way to remind ourselves our fortunate we are :-) Tuvalu was interesting, and a last-minute trip, so a nice surprise. Will try to get the blog post done this week. Happy new year!